It began with a plan for a residential meeting in London, but it turned out that the only dates available at the conference centre were in the half-term holiday and lot of people couldn't attend (probably why those dates were available). So a new arrangement was made for different dates at a very different venue which everyone could make - near Scarborough in Yorkshire. If the meeting had been in London everyone would have gone by train, possibly with a lift to a Lincolnshire railway station to start with, but by train. In the event, I think two of us went by train: the rest used cars, only a few of them sharing, partly because we were a scattered group and offering lifts was not going to work for everyone. The drivers don't know what they're missing in terms of engagement with the world. The slight snag with train travel was that the venue was well outside the town and onward travel by road was needed. There was a bus, so that was OK. Good connection to get there, not so good coming back, but tolerable. I planned my travel and booked my train tickets from Stamford to Scarborough, with a change train at Peterborough (as ever ...) and York. I was able to book well in advance and bought First Class between Peterborough and Scarborough (but, naturally, only claimed standard class expenses). Travelling over lunchtime allowed me to take full advantage of the included catering on East Coast First Class before changing trains at York, a very relaxed hot lunch with wine and coffee. At York I caught a Trans-Pennine Express connection to Scarborough: this is an hourly service of reasonably comfortable diesel units from Liverpool, but how ever fast they cross the Pennines they do not really deserve the word "Express" on the section between York and Scarborough! The Scarborough Spa Express this was not, but it got me there safely, comfortably and on time according to the timetable. 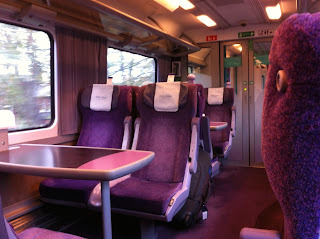 I was the only passenger in First Class on this train, as I had been when used this company's service to Scunthorpe earlier in the year. Outside the station was a bus stop and I met a colleague from Grantham there, the only other one to come by train and bus. The internet has made this sort of thing so much simpler - we knew what bus we needed, when it would leave and where to find the stop before we'd left home, and we knew we would meet one another at Scarborough, too. Travelling on the top deck we enjoyed the Yorkshire scenery and, following our progress on my iPhone were able to stop the bus at exactly the right place and began the walk up the long private road to the conference venue. We had begun striding this out when a car-borne colleague offered us a lift for the half-mile or so up to the house, and while we had both planned to walk and had budgeted time for it we were not so bloody-minded or anti-social as to turn down the offer. This trip had meant only two nights away and so with a little care it was possible to get away with minimal baggage. I needed some stuff for work (and mercifully had allowed spare capacity because while there I acquired a very large file to bring back!) and spare clothing in case of wet weather, but all fitted easily into a overnight bag plus my backpack. This is ideal for the amount of walking I had expected to do - wheeled cases are OK for rail stations, airport and city streets but not rough country lanes. After a couple of days of inspiring talks and amiable networking and friendship and a day of study and planning, together with some great meals, uplifting worship and grand scenery (mostly seen through windows as the only free time was also the only time it rained), it was time to pack up and go home. I had allowed time in Scarborough for some photography, and was also in no hurry to get to the bus stop since the next bus was some while after our last engagement, but in any case those of us with trains to catch were given a lift back into Scarborough by another friend, so I had more photography time than I had bargained for and went on quite a lengthy walk around the town, some of which I knew from accompanying school trips there many years before. Walking round the headland between the north and south bays, with the castle high above, was a blustery experience. There was a very strong wind carrying some sea spray and it was very invigorating at the time, although did take some energy! I took many photographs of art deco architecture - my main purpose - and explored some places I had not seen for a long time, and as the November evening drew on and darkness fell I made my way back to the station to await my train to York where the East Coast connection to Peterborough, on which I would now enjoy a light dinner, would soon pick me up. A final change there for Stamford and home. I love those vintage (vintage or vintage-style - I'm not even sure!) Scarborough posters! What a shame it rained during your free time though, it's a lovely place to walk. I think the posters are retro-style, Natalie. Art deco redolent; my favourite style.